A 30-year-old female military recruit presented to her medical “sick call” clinic with a cough and pleuritic chest pain. 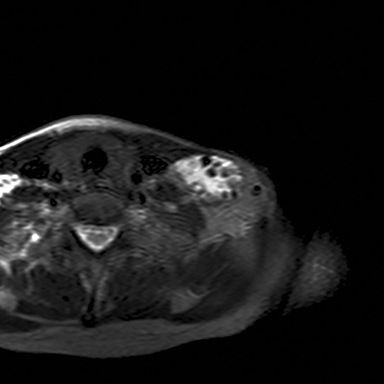 Physical exami nation demonstrated an approximately 3 cm soft tissue mass in the left supraclavicular region of the neck with palpable hard nodules. The remaining physical exam was unremarkable. The patient agreed to surgical excision and the final pathologic diagnosis was consistent with a venous malformation. 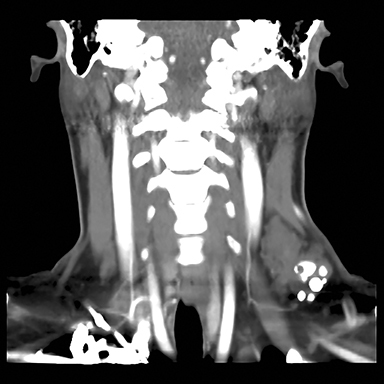 A chest radiograph demonstrated multiple radiopacities overlying the left side of the neck (Figure 1). 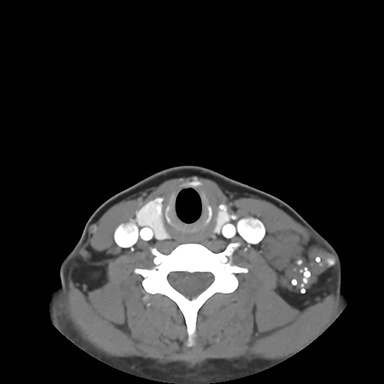 A subsequent contrast enhanced computed tomography (CT) imaging study of the neck revealed a lobulated soft tissue mass with multiple coarse calcifications in the expected location of a level 4 lymph node (Figure 2). 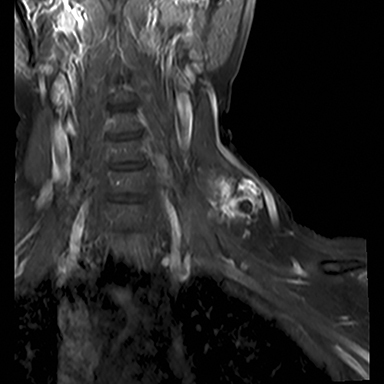 Magnetic resonance imaging (MRI) of the neck with and without contrast was performed to further characterize the neck mass. The 2.7 × 3.7 × 5.3 cm mass appeared isointense to muscle on T1 sequences, heterogeneously hyperintense on T2 sequences with diffuse enhancement on the post contrast images (Figure 3). Additionally, there were T1 and T2 hypointensity foci corresponding to the calcifications seen on the CT and chest radiographs. No flow voids were identified. Calcified neck masses seen on radiologic studies are unusual in young adult patients and can represent a calcified lymph node or a calcified soft tissue mass. In a report reviewing 2,300 neck CT scans, only 1 percent of the radiologic studies showed nodal calcifications.1 Within the nodal calcification group, 31 percent were benign, 23 percent had previously treated diseases, and 46 percent represented malignant disease. 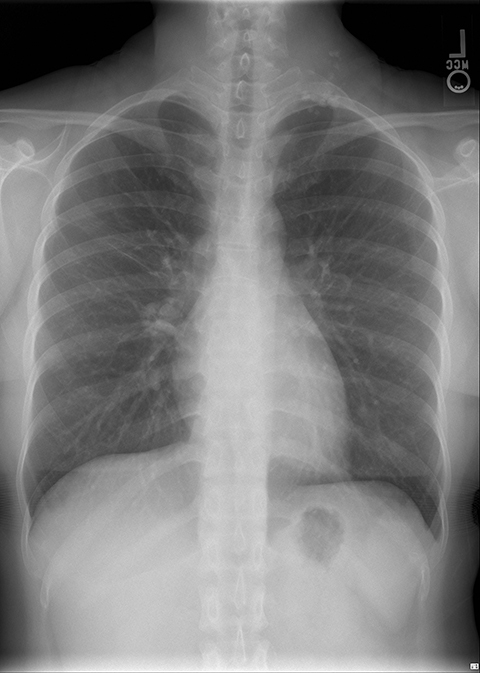 The benign calcified lymph node group included patients with tuberculosis, sarcoidosis, and amyloidosis. The previously treated diseases group involved patients with prior treatment for lymphoma, acute infection, and sinus histiocytosis. The malignant disease group included patients with metastatic thyroid carcinoma, metastatic squamous cell carcinoma, and metastatic adenocarcinoma. The study concluded that lymph node calcification is not a reliable predictor of either benign or malignant disease; however, it may suggest a limited differential diagnosis. Vascular anomalies can often be differentiated based on imaging.6-8 Infantile hemangiomas are T1 isointense to muscle, T2 hyperintense and demonstrate flow voids. Furthermore, they have homogenous enhancement and do not contain phleboliths. Venous malformations are T1 isointense to muscle, T2 hyperintense and do not demonstrate flow voids as in our patient. Venous malformations also enhance on post contrast sequences and may contain phleboliths presenting as a calcified lesion. Lymphatic malformations are T1 iso/hypointense to muscle, T2 hyperintense, and can have fluid-fluid levels. On CT imaging, lymphatic malformations are low density and only show enhancement along the wall and septa on post contrast sequences. Arterio-venous malformations are distinguished by the multiple flow voids and visualized feeding and draining vessels. There is no soft tissue mass as seen in other vascular anomalies and enhancement of the vessels is seen on the post contrast sequences. Venous malformations are the most common type of vascular malformation and are composed of ectatic venous channels that can lead to venous stasis, thrombosis and phleboliths formation. The aberrant venous connections contribute to venous congestion and gradual expansion of these lesions.8 Most cases are sporadic; however, familial venous malformations can occur and are inherited in an autosomal dominant fashion.9 These lesions can present with swelling and pain and have a propensity to involve deeper structures. Venous malformations are the most common vascular anomaly containing calcified lesions and should be considered in the work-up of a calcified neck mass. Eisenkraft BL, Som PM. The spectrum of benign and malignant etiologies of cervical node calcification. AJR. 1999;172:1433-1437. 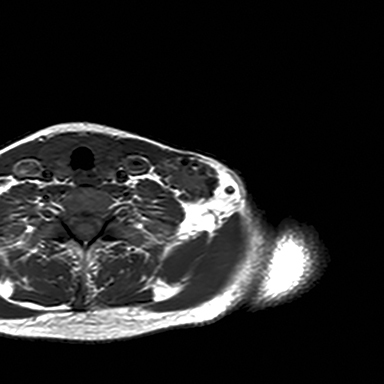 Keberle M, Robinson S. Physiologic and pathologic calcifications and ossifications in the face and neck. Eur Radiol. 2007;17:2103-2111. Jones HA, Manjaly JG, Sandison A, Almeyda JS, Sandhu GS. Acute airway obstruction secondary to vocal fold heterotopic ossification. 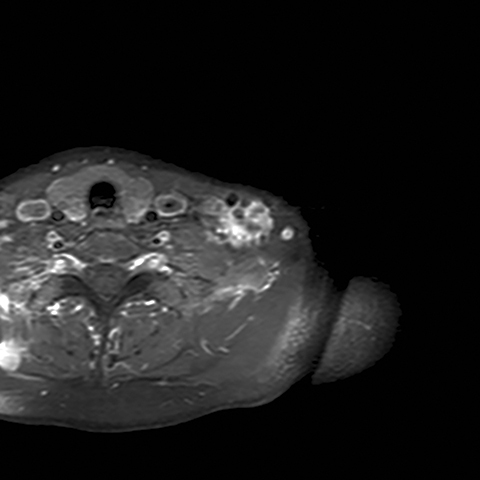 Head and Neck Pathol. 2015;9(1):96-99. Wu G, Sun X, Ni S, Zhang Z. Typical nodal calcifications in the maxillofacial region: a case report. Int J Clin Exp Med. 2014;7(9):3106-3109. Hessel AC, Vora N, Kountakis SE. Vascular lesions of the masseter presenting with phlebolith. Orolaryngol Head Neck Surg. 1999;120:545-548. Puttgen KB, Pearl M, Tekes A, Mitchell SE. Update on pediatric extracranial vascular anomalies of the head and neck. Childs Nerv Sys. 2010; 26:1417-1433. Warren TA, Gandhi M, Panizza B. Pictorial review: Vascular anomalies of the head and neck. J Med Imaging Radiat Oncol. 2012;56:84-92. Richter GT, Friedman AB. Hemangiomas and vascular malformations: Current theory and management. Int J Pediatr. 2012;2012:645678. Frieden IJ, Rogers M, Garzon MC. Conditions masquerading as infantile haemangioma. Australas J Dermatol. 2009;50:77-99. Olszewski MA, Ayala MA, Yencha MW. Venous malformation. Appl Radiol. 2016;45(3):33-35. Prepared by Dr. Olszewski while working in the Department of Imaging at Captain James A. Lovell Federal Health Care Center; Dr. Ayala while working in the Department of Otolaryngology at University of Kansas Medical Center; and Dr. Yencha while working in the Department of Otolaryngology at Captain James A. Lovell Federal Health Care Center, North Chicago, IL.